Chantel, the Princess of Freedom, continues on her quest to find the four relics in order to defeat the Evil One and save the Four Lands. Having recovered the Golden Sword of the North, Chantel must now travel to the deserts of the South to find the Enchanted Medallion. As she searches for the Wise One of the South and for her Soul Mate, Chantel learns more about her abilities and faces temptations from the Evil One. Followed by Aquila Bellum, the Snow Walker and Warlord of the North, and facing the Warlord of the South and his Sand Divers, Chantel must seek more allies from the people and creatures of the deserts in order for her quest to be successful. Oliver Neubert continues the saga of Chantel and her quest to save the Four Lands with an excellent sequel to Chantel and the Quest for the Golden Sword. 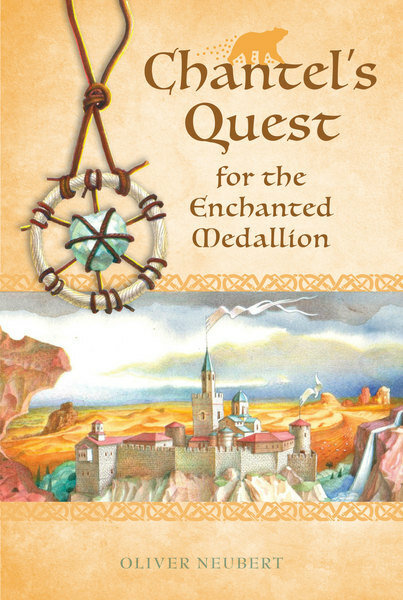 Chantel's Quest for the Enchanted Medallion contains all the magic and wonder of the first book while expanding the reader's knowledge of the Four Lands and the challenges that Chantel faces. As with The Golden Sword, Neubert has created a host of fascinating people and creatures to fill the world of the Four Lands while deepening the reader's knowledge of the characters from the first book. The characters and their relationships grow more complex in The Enchanted Medallion. The majority of the characters need to choose which side they are on and must make this choice more than once. Good characters, including Chantel, are tempted by the Evil One. Dark characters, including Aquila, find themselves doubting the path they have chosen. The depth of the characters and the attention Neubert has given to creating them make the characters extremely appealing and provide many opportunities for the reader to closely identify with the characters. The increasing complexity of the characters also makes the relationships between them more intricate and intriguing. Neubert carefully shows the increasing intricateness and connections, while not revealing more than is necessary, leaving the reader wondering about the connections and waiting for the next book to find out more. The presentation of the characters and their relationships provides a deeper and more compelling story that draws the reader into the Four Lands. As the characters and their relationships become more complex, so does the narration of the story. In The Golden Sword, the narration primarily followed Chantel, with a few short pieces about Aquila Bellum and other characters. The narration has expanded in The Enchanted Medallion, following Owl, Fin, Enos, Laluna, Mother Nature and others, in addition to Chantel and Aquila. Chantel is still the primary character, but the narration is reflecting the complexity of the world and the quest which brings a greater depth to the story. Neubert has followed his own imagination with the plot, resulting in many surprises for the reader, some pleasant and some not. He also resists the temptation to hint and foreshadow much of what might happen in the later books. The limited omniscience of the narrative aids in this, providing the reader with all the information necessary for The Enchanted Medallion but not giving away the future. The end of the book cannot easily be predicted, let alone the end of the series, which makes Chantel's Quest for the Enchanted Medallion refreshing and fun. The reader will always have more questions than answers, a situation which adds to the appeal of this series. Oliver Neubert has created a magical and intriguing sequel about the Four Lands, one which shows the depth of his imagination and the strength of his writing, leaving the reader waiting for more. "I would give this book a 5 in my picnic basket. This series is a must have for my classroom. The vivid descriptions of the characters will help teach character development. The students can follow Chantel through her quests to obtain the lost items to fight the evil ones. I enjoyed how the author chose to use the backward spellings for the characters in this book. Student really enjoy fantasy, and this series works their imagination while they are reading books that are very well written. As I read I my visualization was so vivid that I could picture the movie that could go along with it. This is what we want for our students. I hope is not to long before the next book in the series is printed." "This is definitely a 5. Chantel's journey isn't only the journey of a little girl trying to have an adventure. It mimicks an adult trying to decide what is right and wrong with the world. Chantel is learning that not everything is as it seems -- is Owl actually evil? Is Aquilla remembering what it is like to be good? What will happen to Laluna? There are a lot more questions that I'm looking forward to finding out. I also now need to read the first book to be caught up with what is going on. What I love best about this book is that it is such a good read-aloud. The kids will definitely be paying attention. It is also good to start different types of discussions: friendship, the environment, how do you know what to do in a difficult situation, the difficulties with trying to be perfect. This book covers everything and I recommend it for all ages."